Jarinko Chie: Bakudan Musume no Shiawase Sagashi (じゃりン子チエ ばくだん娘の幸せさがし, Jarinko Chie: Bakudan Musume no Shiawase Sagashi? lit. Chie the Brat: Bomb daughter finding happiness) is a graphical text-adventure game developed by Konami for the Famicom and published in Japan in 1988. It is a game based on the Jarinko Chie anime and manga about a dependable girl who struggles to help her troublesome father run a small tavern in Osaka. Unbeknownst to her dad, she occasionally visits her mother who left him not too long ago. She plans on trying to reunite them, but not until her father gets a job. The game follows the plotline of several episodes of the anime. Though it is largely text driven, there are moments where the player must play a mini-game in order to advance to the next chapter of the story. Much of the text in the game is presented in traditional Japanese orientation, written top to bottom, and right to left. 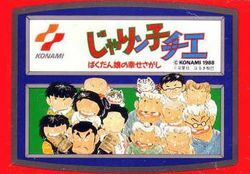 The game was only released in Japan, and never translated from the original Japanese. This page was last edited on 21 July 2013, at 21:37.